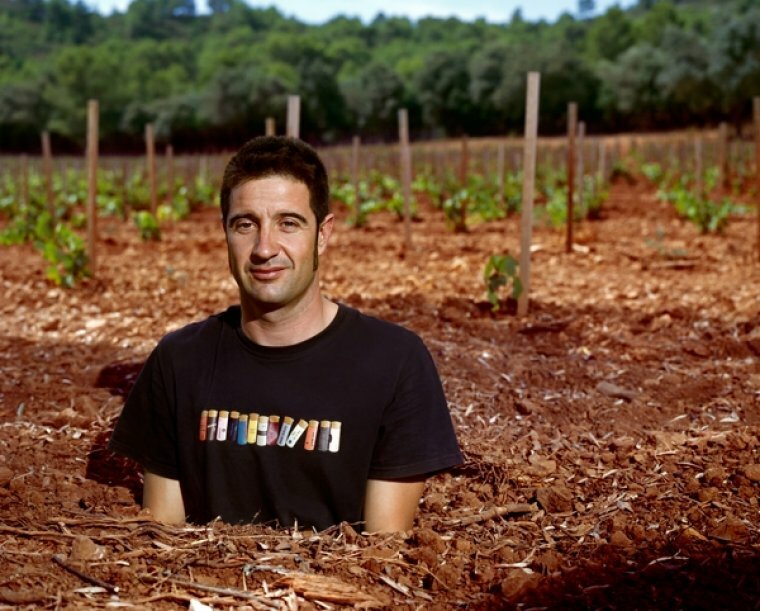 Francesc Grimalt (Felanitx, 1972) is an enologist and co-owner, along with Sergio Caballero, of 4 Kilos Vinícola, one of Mallorca's leading wineries. He took the wine's path when vines were being grubbed up all over the island. Against the grain. He was among Ànima Negra's creators, Mallorca's most international wine. He says he's always been under the impression of being a weirdo who, as a kid, enjoyed watching carboys being filled up from the casks. Now he makes special wines, like their image, their presentation and their philosophy are. Through very modern and very unusual aesthetics, rarely seen in the wine industry, he talks about respecting the land, sustainability and questioning traditions without losing them from sight. His wines are equally sold in Mallorca, the Spanish state and internationally: Australia, Peru, California or New York, with a yearly production amounting to 90.000 bottles every year. Your wines are a success everywhere they go and their look, their brand image and their originality at presenting them, too. I've been accused of focusing solely on marketing and that's not true. I'm interested in the whole process, from the vine to the final consumer. I like it all and I want to be personal in everything. I look at the world and I do the necessary adaptations of things I'm interested on. A singular wine is a success? It's not worth starting if you'll do the same everybody else does. The others already do it... but with nuances. If your best friend gets married and you show up dressed as a professional, you'll be different and you'll get everybody's attention, but you'll look ridiculous. You have to be different but in an elegant way. How did you get into the wine's world? Things have changed a great deal and now Mallorcan wine is consumed with a certain degree of normality. How was this achieved? Yes, that's true, but it's not a Mallorcan success. The Germans were undoubtedly the ones to discover Mallorca's wines and locals followed through. And I'm cool with it. You started making wine 23 years ago and the wine industry in Mallorca was entirely different. Now there's nearly 70 wineries, with a lot of big, new ones. What do you think about it? Everything's a process. And now, that we don't have seasons anymore, wine's fantastic because it allows you to do this... Being in touch with the real world once again. In Mallorca there's a return to agriculture. In a place were traditionally we were all peasants. And now about 40% of its agriculture is organic. The market demands it. It may be a trend but I'm not against them if they're good. I don't care. We do organic wines and we won't do anything at the winery that can be done at the vineyard. That if we succeed in having very good grapes, our wine will need much less of our intervention at the winery. I once heard Gérard Gauby said vineyards have to be managed like forests, as a whole, undetached from everything else. It's basically a matter of balance. I'm a judo enthusiast and balance is essential. If you lose it, you fall, and it happens the same with the environment. Balance must be kept because otherwise something will get damaged or hurt. If you link enology and profitability and you push it too hard things don't go well. Superproductions don't work. Why do biodynamics work? Because it lowers performance and makes plants with more defences and better outputs. Reducing intervention is a trend. Even to the extreme, as in natural wines. What do you think about it? We don't produce any natural wines. We produce Motors, which doesn't have sulphites but it's not a natural wine. There's good wines and there's some that are not. Both natural and traditional. I don't like the process being used as an excuse for flaws. Wine must be good. Having said this, natural wines have questioned everything. Everything. Even colour. And this is great! They've caused an earthquake and have made us rethink everything. I love it. Since I started making wine, this could be the best moment. Nowadays wine's world is like a three-ring circus with every possible spectacle, there's even strippers on it! Winemaking is addictive, it's an element of pleasure and its end is to enjoy. Wine stands outside time. A wine bottle stays where it is. When you have wine from many years ago and you realise all this time has passed,or how the world was at the time it was made, it's amazing! A thousand things have happened and it's been there, doing its thing inside a bottle, oblivious to political changes, for instance. Of course there's Alsatian wines that were German at the time they were produced and now they're French... It's so cool! It's fantastic! I would love to make cask wine and to have people coming to my place to fill their carboys and the like. I would really love to. Some people ask me "so why don't you do it?" Truth is I don't know, but I would love to.